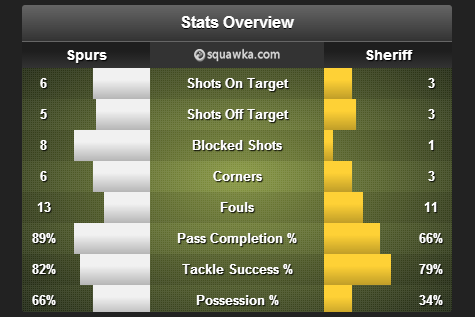 Tottenham maintained their 100% record in Europe this season as they against Sheriff at White Hart Lane last night. Spurs have confirmed their place in the next round with this victory, but would need to win against TromsA? to win this group. Meanwhile Sheriff are on the verge of being knocked out of the tournament; although mathematically they can still qualify, but they will need to win their next two matches and hope that Russian side Anzhi lose their last match against Spurs. Tottenham dominated possession from the start of the game, but the best chance of the first half fell to Sheriff as Ismail Isa came close to providing them the lead. Tottenham on the other hand failed to create too many clear-cut opportunities despite dominating possession in the first half. In the second half Spurs came out with far more intent and increased their pace in attack. Eventually, in the 60th minute, record summer signing Erik Lamela provided them the lead with a neat finish from a tight angle. The former Roma attacker started the move with a pass to Christian Eriksen, but the Eriksenai??i? ?s return pass was blocked by a defender and the ball fell kindly into the path of Lamela, who slotted home with his left foot. Lamela was in the action once again as he was fouled inside the penalty box by Djibril Paye and the referee pointed to the spot. Jermaine Defoe stepped up and converted the spot-kick with aplomb to double the lead for Spurs. But like in the last game between these two sides, FC Sheriff didnai??i? ?t go down without a fight and just five minutes later Ismail Isa, who scored over the weekend in the domestic league, pulled one back for the away side. Spurs managed to hold on to their one goal advantage and, despite their spirited performances in both the matches against the London club, Sheriff didnai??i? ?t have anything to show for it. ai?? ?We still have to make sure we honour the Tottenham shirt.ai??? ai??i?? The Tottenham Hotspur manager told the press. ai?? ?It was very emotional evening because I scored my first goal. I’m very happy about that and very happy that we won as well. We have a very strong squad and it is very competitive. We always want to do well in all the tournaments we play in. 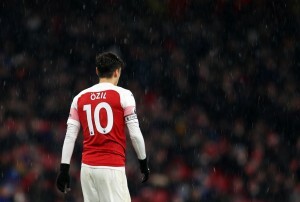 All of our players are strong, whatever their position and in that position [right wing] there are two or three players who know the position well. That means that there is a lot of competition and we have to keep on improving. I heard all about what those two [Ricky Villa and Ossie Ardilles] did and it is really inspirational for me. Everyone knows what they did here.ai??? ai??i?? Lamela said. 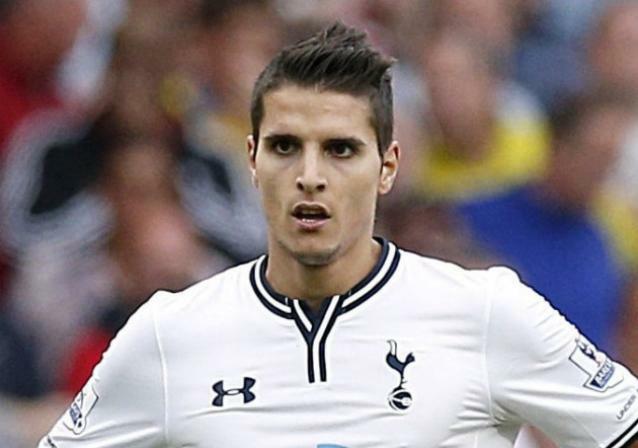 Erik Lamela arguably produced his best performance for Tottenham Hotspur since signing for the London club this summer. He has taken his time to settle down and while many people have questioned the huge price tag him, Lamela certainly has the talent to prove his doubters wrongs. He scored the first goal with consummate ease from a tight angle and created the second by earning the penalty. The above heat-map depicts his movement and positioning on the pitch.